What to look out for when choosing an escorted tours company? Planning a trip can be overwhelming. It requires a lot of research and organization. To save time and avoid the stress that organizing brings, many people turn to tour companies who will do all the work for them.The company will tailor and make a detailed plan of a tour according to the client’s needs and wishes. Tourists can also join some of the already well planned and organized tours that provide an incredible touring experience at a more reasonable price. Escorted tours companies are becoming more and more popular. One must be very careful when choosing an escorted tour; unfortunately not all of them are of a high quality. A trip can be successful with lots of new, incredible experiences, or it can be disappointing due to its poor planning and organization. Luckily, there are some great escorted tour companies that provide excellent service. 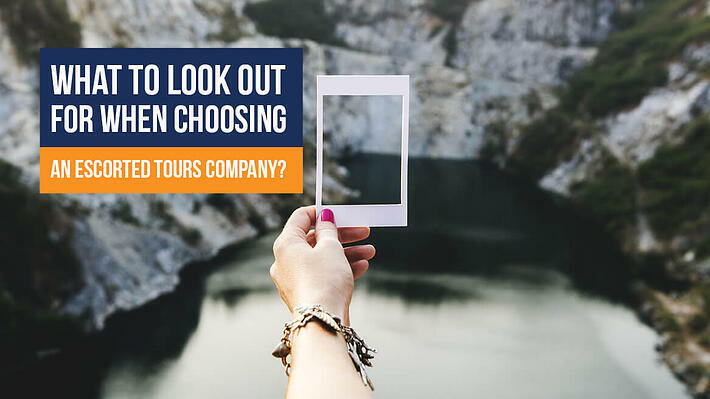 Here are a few things to be aware of when choosing an escorted tour company in order to get an amazing experience from your trip and choose the right one. The first and the most important thing is the content of a tour. An escorted tour which has too many activities on its schedule doesn’t mean it’s a good one. Seeing a lot of places and landmarks without quality time to explore and enjoy them might ruin the experience. If you’re just going to see some things from afar or briefly, it won’t give you the full experience. One must have time to see and explore the key sites in detail, learn and enjoy as much as possible. Another important thing is that the tourists have enough time and space to talk with local people, learn from them about their culture and lifestyle. A good escorted tour company will make every effort to offer good content so the tourists can benefit the most from the trip. And lastly, does the content meet the needs of the tourists? Some people prefer museums, galleries, historical sites, while others want to explore nightlife and beaches. Some companies offer both and are well balanced, while others target specific groups. Tours are organized for tourists of various ages. They have their target customers and plan the trip according to the tourists’ age and needs. Travelers who want to meet new people, make friends, have fun, share the joy of travelling with others and have a high quality service choose escorted tours. But, nobody wants to end up spending a vacation with people that are too old or too young. The size of a group plays a huge role for some people; smaller groups or larger ones do not work for everyone. Knowing the number of people who are going to be co-travelers can help you prepare better for a trip and have more realistic expectations. A good tour company will make sure the content is adjusted to the tourist group, their needs and expectations. The good thing is that you can always search for reviews and see what previous tourists say about a company. There will be a mix of opinions and experiences, the good ones and bad ones. From all reviews one can find on the internet, it’s not too difficult to get an overall picture of the company. If it has more negative reviews than positive, choosing some other escorted tour company is a much better idea. You are looking for a quality tour with other people, and there are the companies which can give you that. You want to be sure that the company places your satisfaction and excellent service above everything else; you want to know your money is in good hands. Checking the testimonials of previous customers on the company’s site can also be helpful. One of the best indicators that a company is a successful one is the number of years it has been in business and how many tours they offer to a given destination. Each company has its own prices. Sometimes, their charges are fair, but there are some companies that will charge unfair prices for what they offer. Luckily, there aren’t many of these. Lots of them do their best to offer as much as possible and provide a high quality tour for a very acceptable and reasonable price. Those that do charge a bit more, also provide excellent service so the money is usually worth it. When choosing a company, always ask about the content of a tour, the schedule, and their plan. You want to know how they plan to spend your money and you decide whether it’s worth it or not. You might be charged for a five star hotel but end up being in a three star hotel. Another thing to be aware of is that those tours that seem to be pretty cheap might not be. Check if they include all the fees you’ll have to pay once the tour starts; meals might not be included, or some excursions that are on a list will require extra fees.